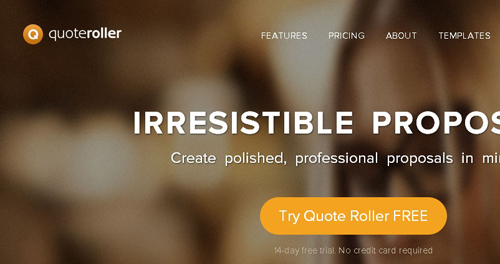 Quote Roller is a great proposals platform that is able to create, to send, to track and to manage sale proposals online. In other words, this efficient product could save your time and help your business flourish, which is why every businessman and businesswoman should learn more about it. Money is an important matter and therefore you should find out more about their pricing details and offers, right from the start. Prices start from $14.99 per month for the basic package, which includes unlimited proposals per month, statistics and iPhone support. The next plan is the professional one and it could be purchased for $19.99 per month. For this money you will have the aforementioned characteristics and plus unlimited analytics and content library. And finally you will have to pay $29.99 monthly for the enterprise plan. As you may have imagined, this package is the fully equipped one and besides the previously written features, it also contains: custom domain branding, proposal templates and design assistance, dedicated account manager and support over the phone and SalesForce and SugarCRM integration. If you are interested in finding out more about the additional features that each plan may include, feel free to check out their website. Moving on, I am sure you are interested in its features, which include time-savers like its drag-and-drop user interface and to their digital signature from within the proposal. Users will be able to skip copy-pasting their information and they can definitely forget about fax and emails, since customers will be able to accept proposals with their web browsers. Another appealing feature of this product is the fact that you can track the proposals and it sends buyers’ statistics concerning the areas that their customers are looking at. This way, they will know what their clients are interested in. Also worth mentioning is that the proposals could be created both in web and PDF format. Quote Roller also features a proposal template library, free and open to everyone, even non-users, with different themes, varying from website development proposal to cleaning proposals. It makes your job a lot easier. All you will have to do is pick the right template for your project and fill it in with your details. But don’t take our word for it, check out their 14-day, no-strings-attached trial. And, if you like it, you could also try out their affiliate program, which allows you to refer customers to them and you’ll get a part of their monthly fee, for as long as they are customers of Quote Roller. In the end, it definitely seems like Quoteroller.com should become part of your business, because as it turns out it is full of advantages and benefits. If you want to check it out for yourself, use our code “LOVETHYDESIGNER” for an extra four weeks, adding up to a six week trial of Quote Roller. Want To Design An Attractive Website? Keep These Things In Mind!